Houston Police Department: What's in a name? What's in a name? 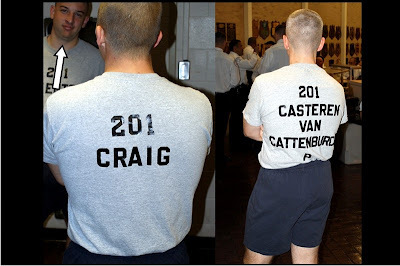 Whether your Officer Craig or Officer Casterenvancattenburch your still going to be called "Officer" for the rest of your career. However in this case it might be a little more difficult. Can you imagine the name tag on the uniform? Ever wonder what happened to Cadet "Smiley" from my previous post on Class 201? Look above under the white arrow....still smiling! Awesome! great to see Cadet Smiley again! Good to see our family name on the T-shirt, that it even fits, and Philip: we're proud of you! Great one! Good luck Officer Casterenvancattenburch.